Forecasting your bar’s expenses are similar to creating your home budget, only it’s a whole lot more detailed. When you forecast your expenses, you anticipate every possible expense that you may incur, but you hope to reduce those expenses and control costs as you actually spend the money. For example, if you estimate your monthly home grocery bill at $100 a week, but you find an excellent sale, you’re going to save the money rather than just fork it over to the grocer anyway. It’s the same with forecasting your expenses for your bar: Plan for the worst case, and then manage the money to the best of your abilities. 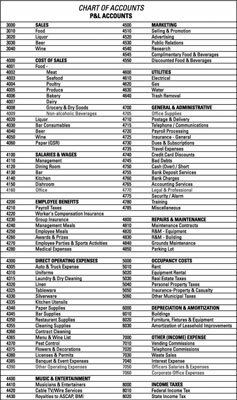 To help you think of every possible thing you may need to get your bar up and running, the following is the list of accounting codes the National Restaurant Association (NRA); has recommended for years. The NRA released a newer version for sale for $75 for members and $150 for nonmembers. If you’re starting a bar from scratch, use this list to help you anticipate expenses you may otherwise skip. The NRA also offers research you can use to help predict your expenses or check whether any of your expenses are out of line. Your local restaurant association should also be able to help you estimate some expenses by obtaining data from other members. This information adds credibility when you’re asked how you derived your figures. When you put together your real financial forecast, include a full year of data and make sure you include every expense you can think of. Some expenses, like snow removal, show up in only a few months. 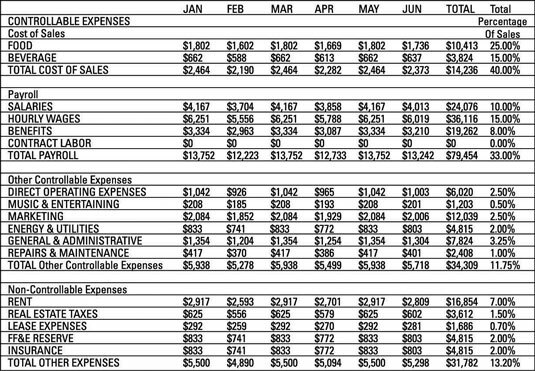 Check out the next example for a sample expense forecast that covers a six-month period. Make sure you remember to include your best, worst, and midrange set of numbers for a complete picture. Yes, complete the worksheet three times. In particular, look at the last column in the chart, Total Percentage of Sales. You’ll use the forecasted sales to figure out the sales for each month. Then multiply the monthly total by the percentage specified in each row to figure out how much you could spend on each particular line item each month. Controllable expenses: These are expense you have control over. For example, you choose how much liquor to buy, how you pour it, control its usage and waste, and so on. These expenses often go up as your sales go up. Non-controllable expenses: These expenses, such as the rent, occur regularly. You have to pay these costs no matter how much you buy and sell. Technically speaking, you should also accrue for depreciation, interest, and other accounting-ish items you may not think about on your own. Get with your accountant for details on how to get this done.